Letcombe Valley has one of only two chalk streams in Oxfordshire. 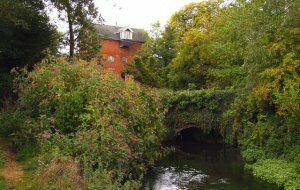 The clear waters of this rare habitat are home to some unusual and interesting wildlife including bullhead fish, brook lamprey - a primitive jaw-less fish, and water vole. The Letcombe Brook, much loved by local people, is a chalk stream that runs from Letcombe Regis to East Hanney, providing water for local use today. It is home to protected species such as white-clawed crayfish and water voles. Chalk streams are globally rare, so the Letcombe Brook Project was set up in April 2003 to enhance and protect the natural beauty of the Brook. East Hanney Parish Council is a member of the Letcombe Brook Project.